Volkano Excite Cam - HD Action Cam 720P / 1.3MP, Silver, 2 inch LCD display, HD 720p video recording, CMOS 1.3 mega pixel Sensor, Wide angle lens, Video records with sound, Photo format JPEG, Waterproof up to 30m, Built-in rechargeable lithium polymer 3.7V 440mAh, Micro USB port, Class 10 Micro SD card of up to 32 GB (not included), Instruction manual, casing, 30m waterproof housing, Suction mount, Helmet mount & strap, Handlebar mount, Car charger, USB charger cable Copyright © 2019 ComXpert International CC - COPYING IS ONLY ALLOWED FOR THE PURPOSE OF SENDING US ENQUIRIES. E&OE. The best price and guaranteed service and backup from official computer suppliers in South Africa for the VK100000SL Volkano Excite Cam Silver HD 720P / 1.3MP Action Cam. The Volkano VK100000SL Volkano Excite Cam Silver HD 720P / 1.3MP Action Cam is available for R441. The product is sold by ComX Computers as new. Prices are valid today 2019-04-23 (before 2019-04-24 , by quote, while stocks last). The product is expected to be in stock, although this is not guaranteed. 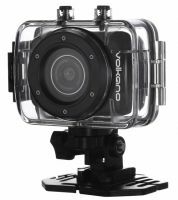 Find related VK100000SL Volkano Excite Cam Silver HD 720P / 1.3MP Action Cam products in our High definition video recorders Category for even more options. Read reviews and find out about VK100000SL Volkano Excite Cam Silver HD 720P / 1.3MP Action Cam. Discounts, specials and cheap prices only at ComX Computers.